Peppers are easy to plant. Prepare the soil 8-10 inches deep. Dig a hole that is as deep as the distanced from the first true leaves to the root ball. Put the fertilizer in the hole (see below). Put the plant in the hole. Put the soil in the hole and lightly press around the plant. Water thoroughly to settle the soil. Put a layer of compost 2-3 inches deep 18 inches from the stem of the plant (see below for explanation). Water one inch per week. Our plants have been outside since the plants had their first true leaves. They are typically very sturdy and stocky from being in the sun, wind and rain. We get nearly 100% survival of transplants that way. 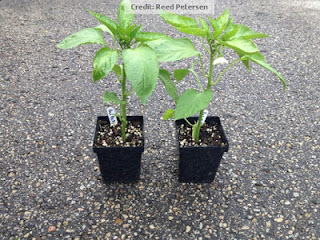 They are not set back by transplanting outside and are way ahead of their green house peers. Use a good balanced organic fertilizer like fish emulsion (fish). You can reapply a dilute version of fish to the foliage of the plants and soak the roots every 3-4 weeks until the fruit starts to mature. You don't want to have fish on any ripe fruit. I do not recommend Miracle Grow as it over stimulates the plants. Yes, they look beautiful but MG creates a lot of foliage and not as much fruit. The fruit is often not as flavorful and MG is made of synthetic chemicals. When someone asks about pepper problems about 90% of the time they are using miracle grow. Here is a trick to improve your fruit set. 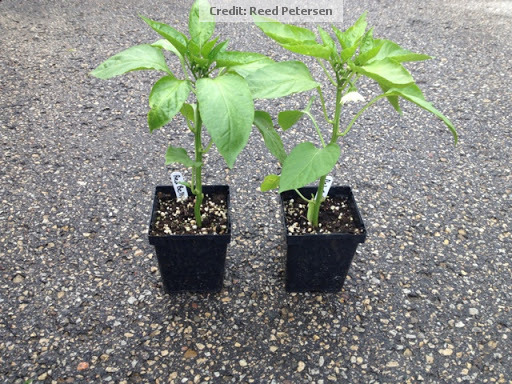 When the plants are about a foot tall and starting to bloom, spray the foliage with a dilute solution of Epsom salts. The dilution is one table spoon of salt to each gallon of water. The foliage will turn a dark green and the plants will bloom profusely. Epsom salts contains magnesium one of the components of chlorophyll which is why the leave turn dark green. Magnesium is also one of the core elements that plants need for reproduction. This is very inexpensive, you can get a pound of salt for a couple of dollars. Use the left over salt for a foot bath. Compost is the true miracle worker in the garden. The layer of compost suggested above is to keep the young plant from contacting the soil. Most of the viral diseases come from the soil. When you use compost, every time it rains you get compost tea. Compost also feeds the biology in the soil. You will find earth worms like crazy around your plants. Compost is like popcorn (my favorite snack) for earth worms. If you don't have compost of your own, you can get a 5 gallon bucket for $0.50 at the waste to energy facility or buy it for $25 per ton in bulk.